At first, I honestly didn’t spend too much time wondering about the issue, I didn’t even bother to cross-check the rules. Like a sheep our company has been reproducing Belgian Champion jerseys using the same old template with horizontal stripes ever since. Last July we had the pleasure to create another 4 champion designs for a bunch of talented bikers riding our custom NODRUGS cycling wear. It is during that period that the question popped up again and it didn’t leave ever since. Do you know this story? You are wondering about something but it doesn’t seem to be important enough to really find out the answer. Actually, most people I know wonder about things that never get answered and most people seem to be at ease with it. So am I… usually… but sometimes you start wondering about exactly the same thing a few months later though it still isn’t a priority to find the answer. After a few times crossing your mind in a few years time, the issue starts to really bother you and you just need to find to answer to get peace. Ever experienced this? Well, that’s exactly what happened to me. 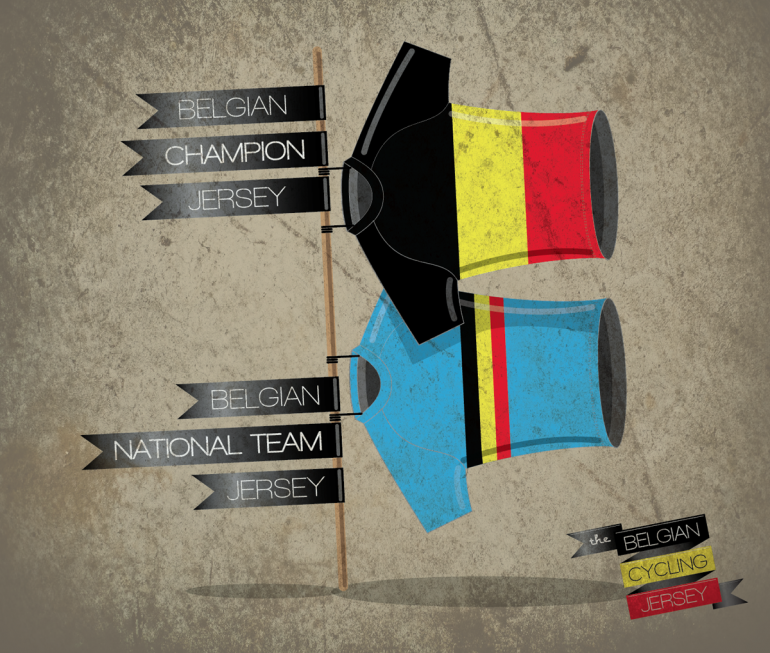 And today, on September 8, 2012, after watching the World Championships mountainbike featuring some Belgians riding the national outfit, a second question crossed my mind: Who decided the national team’s jersey should be blue? The champion jersey is one thing, but for those out there who are not familiar with the subject: We also have a national jersey that all riders selected for the national team are wearing. The design of this specimen is even stranger though visually more powerful since it is mainly light bleu with a Belgian tricolore running along the chest… in horizontal direction off course. That’s the straw that broke the camel’s back so I instantly decided to start ‘a little’ research on the history of the Belgian cycling jersey. I had no idea where this would lead me to, but I just had the urge to do so since wondering about the answer was literally driving me crazy! Around 11 pm tonight my first blogging experience was a fact. Thebelgiancyclingjersey.com is meant to be an interactive research diary. It helps me collect and structure information and thoughts and share them with you who seem to be interested enough to read this blog. Let’s make a promise to myself and to you: I will do whatever it takes to find out the true story behind our Belgian (championship) jerseys. een leuke en facinerend onderwerp; misschien volgend jaar je eerste boek signeren op de boekenbeurs? De truitjes van de belgische selecties hebben toch enkele jaren een ander design gehad. Jaren 90 en begin jaren 2000. Kijk maar naar de WK ovewinningen van Musseeuw en Herreygers. Ook bij de wereldtitel van Filip Meirhaeghe was het nog een ander design waarbij de driekleur amper opviel. Veel succes en ontdekking met je onderzoek. Lol, bedankt Tom. Het zou officieel niet eens m’n eerste boek zijn want ik ben reeds co-auteur van een wetenschappelijk boek in ‘another life’. Maar dit is andere koek. I started this blog without a clue where it would lead me to, it is the journey as such that I try to enjoy. You are right by the way that we had a jersey with some vertically oriented ‘paint stripes’ representing the 3 colors of the national flag. I will write about that soon, I am still collection some data. Thanks for the hints.